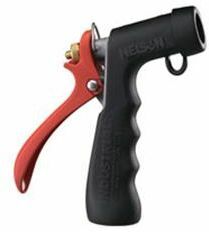 Heavy-duty zinc body,Thermo-Guard insulated, reinforced brass stem and nut with glass-filled nylon handle. Hot water rated to 160 degrees, water pressure rated to 100 psi. Adjusts from mist to powerful stream, clip locks on. Black insulated body.